It all started with an image of Chocolate Affogato on A's FB page which then sent us on a taste-test-excursion to Pizza Libretto as they are one of the (maybe few?) restos in TO who serve it. Excitedly, I arrived at said location, looking for my friend, only to be stopped by the hostess who demanded I tell her what I was doing. Surprised, I quickly told her I was looking for a friend who may already be seated somewhere in the depths of the crowded (and loud!) restaurant. She looked at me incredulously and stated that there was no way anyone could be waiting for me since her waiting list was 2 pages long (!) (and they don't take reservations - another !). Now it was my turn to be confused, so I gave her my friend's name to which she confirmed with much finality that A was not on the list. Shrugging I decided to wait for A, who within minutes bounded up to me with as much enthusiasm as I had had a few seconds ago myself . Together we tackled Hostess and put our names on the 2 page long list. Hostess told us we could enjoy a drink and then she'd call us. We thought she meant hang out at the bar and then she'd call upon us, but she literally meant go out and have a drink somewhere else and then she'd call my cell phone. In 40 minutes. 40 minutes!!! Hungry and deflated, was I, not to say annoyed with the abruptness of the Hostess. A, still in good spirits suggested Golden Turtle just down the street. We decided to check out their menu and then decide whether we wanted to eat there or wait the 40 minutes. The menu was not posted outside, so we had to go inside and ask. By doing so, we were waved to have a seat, to which we lamely protested that we simply wanted to see the menu. Too late. We'd just been seated and handed menus. And we were rather liking this kinder hospitality. So be it. We'd wait for PL to call and then go back for dessert, which was what we had originally scouted it out for. Golden Turtle is one of those brightly lit, bustling, no-nonsense Vietnamese joints where the pho keeps pho'ing and the well, you get the drift. A was reminded why she loves a good photo to go with the menu options, as we couldn't tell what a damn thing was on there. 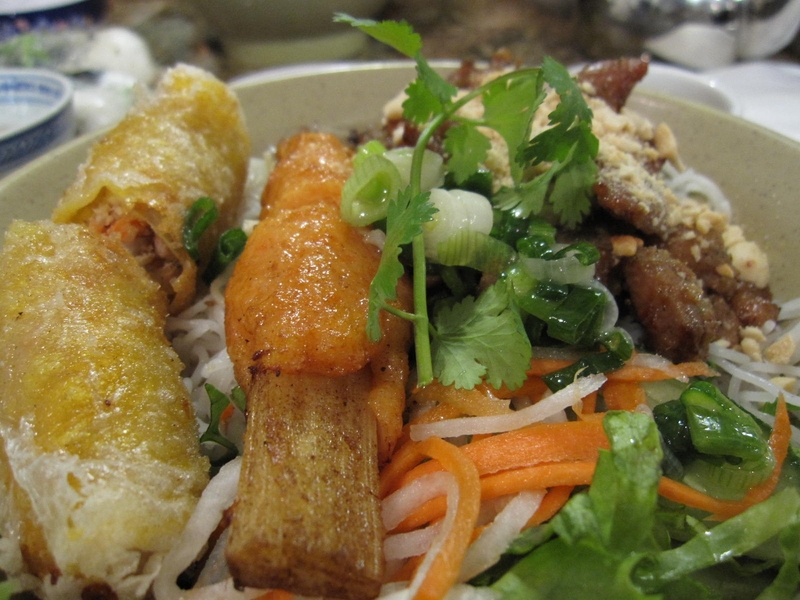 Finally, we opted for the beef cold rolls, the chicken vermicelli with shrimp on a bamboo stick, and beef vermicelli. The cold beef rolls were hearty and refreshing, and we both agreed, a perfect start to the meal. A solid strand of hair was coiled around it in the worst way. Definitely, not a good start to the meal. We showed it to our waitress who simply said, 'Okay' and brought me another bowl of my order. I have to admit, once I'd gotten over the image of the hair out of my head, I fully enjoyed that bamboo shrimp stick. Gnawing on that that stick until the rest of my dish went cold. Besides the hair, we did have a nice meal. During our meal, my phone shrilled twice; PL calling with our "reservations" (why don't they just take reservations in the first place?). We took our time finishing up at GT and sauntered over to PL for our dessert. So a little more than 40 minutes later we were back at PL where the Hostess, as much as she wasn't pleased with us for not answering her calls, was more concerned with her waiting list and adding more helpless patrons to it. I must admit, at that point, it was nice to be instantly whisked away to our reserved seats. Our declaration to our server about us only being there for dessert and not dinner didn't go over well, at all. Neither did our request for two hot waters. We did look over at the tables beside us and salivated at what we saw everyone tucking into. Also, it turned out, my yoga instructor and her friend were sitting beside us; they'd endured the 40 minute wait and it seemed it had been worth it. A and I looked at each other, semi-kicking ourselves for not waiting and vowing to come back soon and try the pies. The pies and maybe the tiramisu again, but certainly not the affogato which was disappointing and nothing like the image burned onto my brain. 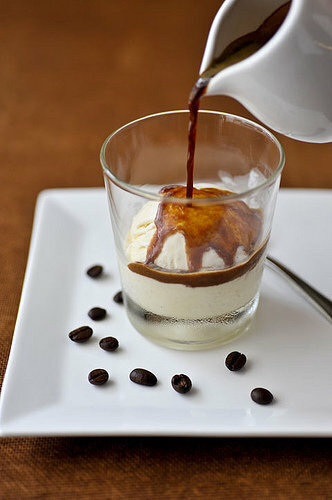 (See first image below, borrowed from this site) and then see the chocolate affogato at Pizza Libretto. That was the image I had in mind. 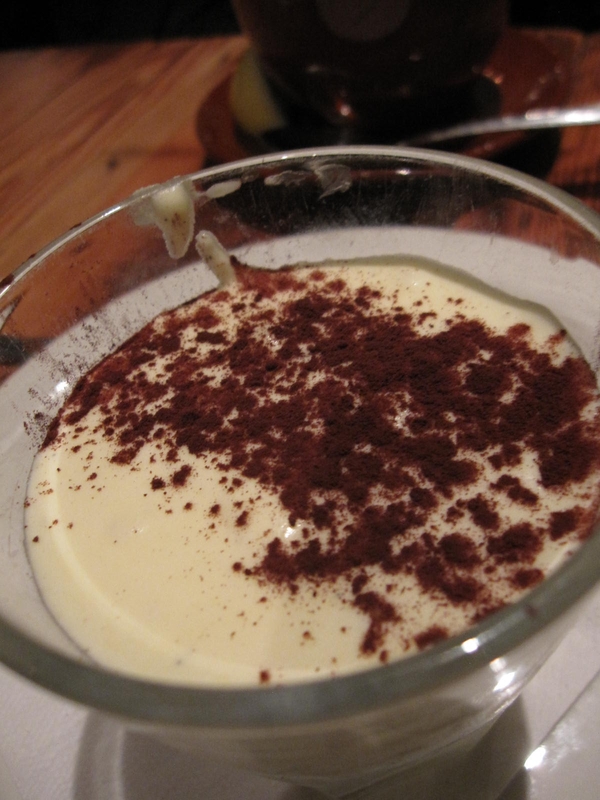 The tiramisu looked a bit better, and A loved it (and for someone who doesn't like tiramisu, that said a lot). I thought it didn't taste like tiramisu, which, perhaps, also says a lot. A few hours later, with sore throats from having screamed over the din of the restaurant, and after many cutting glances from our server, we called it a night. They seemed to want our table to seat the staff for their dinner. How long did they have to wait for it, I wonder? Before all you PL fanatics jump on this review with your rants on how it serves us right and that we should have waited yada yada, note that we are right this moment, planning our return to PL.